There is a new magic formula for intercooler pipe fabrication. This formula requires no welding, no cutting, and no special tools. Making intercooler pipe has never been this easy and trouble-free. This installation guide is designed for a full silicone intake installation in any turbocharged, intercooled car. 1. Decide what pieces you need for installation. You can use two 45* bends for a slow 90* bend. Hump hoses are intended for bends smaller than 45*. They should be used only when necessary since they create more intake turbulence than other pieces. 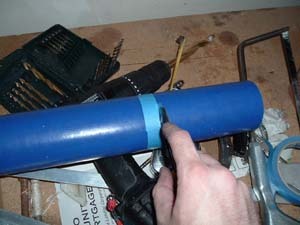 2' sections of silicone hose can be cut to desired length, or even cut to 3" and used as couplers between two metal pipes. a. Remember to order extra. Even if you think you have it figured out perfectly, there may be a small misalignment somewhere that will require another piece. At a minimum, you should order one more hump hose than you think you will need. b. Remember to order the proper reducers. If you have a 2.25" throttle body inlet, and a 2" turbo outlet, and you are building a 2.5" intake, this will obviously require 2 reducers. c. Remember to order sufficient joiners and hose clamps. These parts are sold separately. Each silicone part you order will probably require 2 hose clamps and 1 joiner. 3. Assemble your new intake. It is most effective to start at both ends of a section and build towards the middle. In this example we will build the turbo to intercooler section for a 1995 DSM using a Spearco 2-221 intercooler. To cut the hose to your desired length, first make sure you will have a long enough section of straight hose to hold the hose clamp. Cutting in the middle of a bend may be a bad idea. 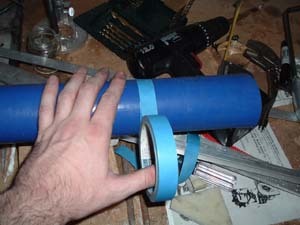 Use a tape measure and marker to make 4 dots around the pipe at desired length. Then use a piece of tape to connect the dots. 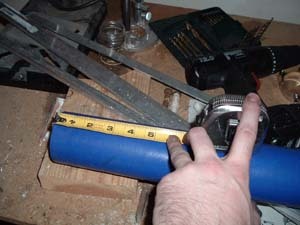 Finally, use a sharp razor or exacto knife to cut the hose. Go slowly, following the tape. During initial assembly, it is recommended to tighten the hose clamps just tight enough to support the weight of the section you are building. This way, you can rotate a section of hose to line it up. After the system is fully built, make sure to tighten each coupler. 4. Check for intake leaks. Our intake leak testers are designed to slide onto the turbo inlet (turbo cars) or at any round section of pipe (non-turbo cars). Place the intake leak tester in the proper location for your car and tighten BOTH hose clamps. Apply pressure to the system using an air compressor. Make sure you keep an eye on the pressure you are applying. There is no reason to apply more pressure than you will run as boost. When you get to levels higher than 10 PSI, BE CAREFUL! if something pops off, it has the potential to create a pretty powerful projectile weapon. You should apply pressure SLOWLY and stand clear of the engine bay until after the system has held pressure for a few seconds. Watch your boost gauge. Leaking intake pressure is normal at a rate of around 1 PSI per second. If there are any significant leaks, try to find out where they are coming from. Usually, just listening and feeling will show you exactly what needs fixing. If not, you can get a bottle of soapy water and spray it in the suspect areas. It will bubble as air leaks through it. Remember that air may leak through your piston rings or turbo seals - this is usually what causes the 1 PSI/second leaking. If you are leaking pressure rapidly but can't figure out why, do a compression test. If you hear a gurgling sound like bubbling oil, but your turbo has no shaft play, you are probably using a ballbearing turbo and the seal is leaky - this is somewhat normal. Your hose clamps should be AWESOME! Silicone is slippery! It wants to slide right off whatever you clamp it to. High clamping forces are necessary to hold it on. If you are using your own clamps, you may have to buy beefier clamps for the troublesome areas. Spray a thin layer of hairspray on the joiner in your troublesome area. Assemble the parts and wait 30 minutes for the hairspray to dry. This will make the surface sticky to hold pieces together and prevent leaks, but not strongly adhere or damage anything. Many people use hairspray on every connection - not only does it make for better connections, but it also makes pieces easier to slide together when you first apply it. Get a bead or lip put on your troublesome pipe. Use some type of adhesive. This should be your last resort since it will prevent you from re-using your silicone hose in the future. The good news is that we will always be offering affordable silicone hose if you ever need it. Whatever type of adhesive you decide to use, make sure it is high-temperature resistant, make sure it is fully dry before starting your car, and DO NOT use too much - if any of it comes loose, it could be sucked into your engine or turbo.